For nine years, I had a great view of the Hollywood sign from our window at work. We always knew how smoggy it was by how well (or poorly) we could see the iconic sign atop the Hollywood Hills. Maybe that’s why I never felt the need to get up close to it, at least until now. On Saturday I met my friend Alex in the Griffith Park parking lot next to the start of the hike. We’d agreed to meet at 10 a.m. but he was running late because he hadn’t followed the directions as closely as I had (I could make a remark here about men and directions … but I’m above that kind of stereotype). From 10 a.m. to 10:15 the parking lot filled up quickly with people who had the same idea we did (it being spring, the weather was perfect for hiking). I waited for Alex on a small grassy area across the street from the parking lot. That is, until I heard a loud snapping sound above my head and jumped up right before a large branch fell to the ground 10 feet from where I was sitting. OK nature, what are you trying to tell me? Shortly after, Alex arrived and I forgot about that ominous sign. We headed off for what turned out to be a strenuous uphill hike. Since we hadn’t seen each other in a while, we walked slowly as we talked and caught up. I was glad I had watched this video from the Hikes You Can Do website because it helped us know which way to go when the path diverged. When we got to the top, we walked around the back of the sign first and took photos of the huge white letters with Lake Hollywood and the city in the distance. Just like at the Getty, it wasn’t clear enough to get great shots but the view at that height is still cool. Then we walked down and around to the front of the sign. You can get fairly close without trespassing for the most part (the road up to the sign was closed to hikers but we, like everyone else, scrambled up the rocky area next to the road to get better photos without feeling like we were trespassing too much). 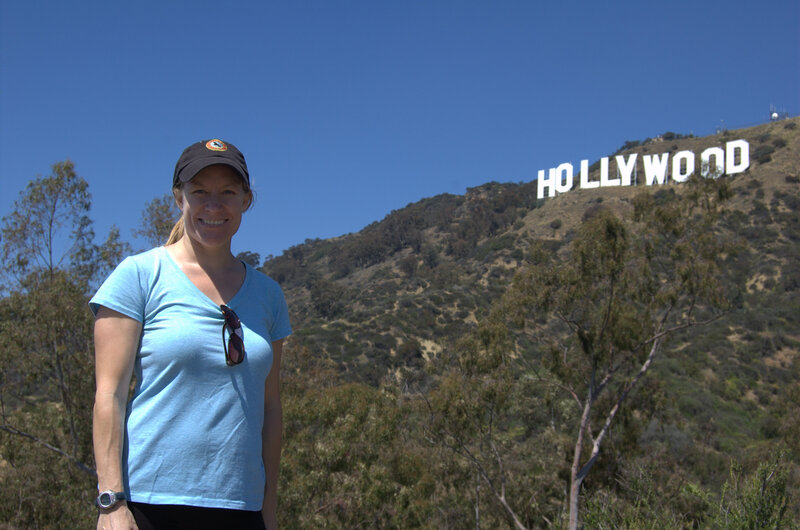 I finally experienced a quintessential L.A. moment — taking a photo in front of the Hollywood sign. Only took, oh, 11 years! Going back down was a bit of a pain because it was all downhill. By the end, 2 1/2 hours after we began, Alex and I were ready to be on flat ground again. Tired and hungry, we went to lunch at Fred 62, a diner in Los Feliz. Sitting outside, sipping my iced coffee and people watching, I was feeling pretty relaxed. It was a good day and a good hike. Next up, Kubrick and a rather large rock at LACMA!